As women, we are taught from a very young age that we have to be okay. We are taught that we must shoulder the emotional burden of okayness, or face the wrath of societal judgement – ‘bitchy’, ‘waspish’, ‘nagging’or, that worst of all condemnations ‘overemotional and irrational’. We smile around the words, I’m fine, hoping that by twitching the right muscles we can fool the world and, maybe, ourselves as well. As autistic women, the burden of okayness becomes even heavier. Many of us have lived our lives desperately trying to cling to a semblance of neurotypicality, pushing down on what we really feel and how we are naturally compelled to act. We have learnt to wear a mask of ‘not autistic’ – forcing a smile, forcing socialisation, forcing everything else to bubble away below the surface facade of coping and quiet hands and culturally acceptable normality. We are women. We are autistic. And we are definitely, absolutely, always okay. I’m not okay and I’m tired of pretending to the world that everything is fine. I’m not okay and I want to start believing that I can really, truly be honest about that. I’m not okay and I feel like I’m a volcano – when I break through the solid rock, there’s going to be a hell of a lot of collateral damage. I want to tell the the world that I’m stressed. I want to let them know that I feel completely and utterly overwhelmed, overworked yet underappreciated. I want to ask the world to stop spinning for just one moment, to turn around, hold out a hand, and just wait there for me to get back on my feet and catch up – because at the moment I’m crawling along on my belly, and it hurts, and I can’t do it for much longer without something disastrous happening. I’m tired of shouldering this unbearable weight of okayness – at home, at work, in public, and even, I think, in my sleep – because we’re not designed to carry this. Is there any wonder that I know so many autistic women who suffer from severe forms of depression and anxiety? The kind of mental health difficulty that has to be medicated in order for someone to be able to haul themselves out of bed in the morning (not that there’s anything wrong with taking medication for mental health issues – please see my very passionate and somewhat utterly-done defence of my medications here). And we do endeavour to haul ourselves out of bed and into work (or school, or general social spaces) – because if we don’t emerge with a smile, then we are struck down as failures. I remember asking for a mental health day in my last job – finally relenting to the pressure I’d been trying to ignore – and being told that it was probably better for me if I took it as last minute annual leave (rather than incurring another day of incriminating sick leave on my record). I’ve never asked for anything like it since. The world has made it very clear that if I absolutely must inconvenience everyone by being ‘not okay’, then the least I must do is pretend that my absence is actually a lovely, preplanned holiday. The mask is such a consistent part of my life that it’s become fused to my skin – it physically hurts to take it of, and the thought of removing it terrifies me. When they sit me down in one-to-one meetings at work, and ask me how it’s going, or how I’m doing, every inch of me wants to cry and beat the table and say everything is not okay, everything is not okay at all, but the façade is so tightly strung around me that I smile, and shake my head, and say everything is okay. Often I‘ll laugh a little and let slip that it’s a little bit stressful, but the insinuation of it is that its something I can deal with; something a little inconvenient, irritating, like the drip-drip-drop of rain on a walk. I don’t tell them that, actually, I’m stuck in a monsoon. I felt the gazes I received this evening on the station platform, tears pouring down my face as I tried to work out which delayed and altered train I needed to be on to get home. I felt the wrinkled eyes as I flinched when the crowds at the departure board brushed past me, and the unspoken judgement as I tapped my feet and pulled my hair and knocked my knuckles against a spare bit of wall. Be normal. Be okay. Don’t be such a hysterical woman. Don’t be such a hopeless Autistic. On the surface, its so much easier to be okay. To not let them see that you’re falling apart. To not give them the chance to tut and mutter and whatever else I imagine people doing behind my back. It takes so much courage to wipe off the smile and say no, actually, I’m not even in the general vicinity of okay. It takes so much bravery to let go of the rope -the rope that keeps you safe even as it frays and cuts into your palms – and let the world know that things are not great, things are not alright, and things are definitely not okay. I’m tired of being okay. The act of being okay, although easier in the here and now, is destructive. It tears through you little by little. Like moths through a jumper. Like a virus gradually working it’s way through your body. Like a big bunch of dishonesty strung around your shoulders and dragging you into the ground. Autistic women deserve better than to carry that weight of expectations, wrenching us in awkwardly painful directions for the benefit of others. We deserve so much more – we deserve to live our personal truths, without mask or make-up to make it more palatable. I don’t want to be a martyr at the feet of okayness. I don’t owe the world that sacrifice. I’m sad. I’m angry. I’m grumpy. I’m tired. I’m a hell of a lot of things. But I am definitely not okay. 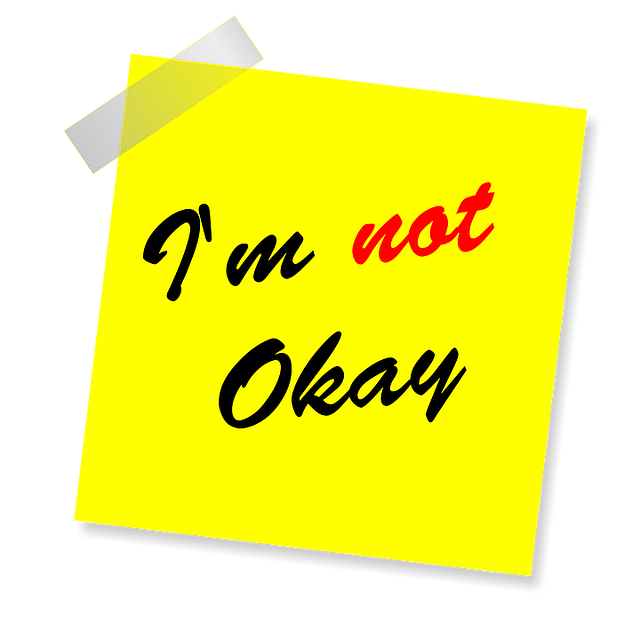 There’s such a powerful feeling that comes from admitting and proclaiming that you’re Not Ok. For me, I think, because it gives me a starting point. I’m Not Ok, now what? It’s definitely ok not to be ok, hopefully your post gives people the permission they internally feel they need to drop the mask!